Buy a bouquet of blue flowers inexpensively. Delivery of a blue bouquet of flowers for a holiday. ❶ Buy a bouquet of blue flowers inexpensively. Delivery of a blue bouquet of flowers for a holiday. To please relatives and friends, as well as to impress your girlfriend with an original gift is possible by ordering delivery of a bouquet of blue flowers directly to their home in Riga and any other city in Latvia. 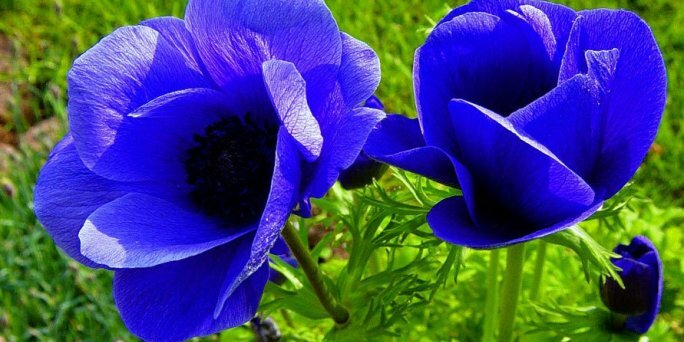 An unusual and amazing gift will be a bouquet of blue flowers, the delivery of which to any address in Riga and all over Latvia is offered by the online shop KROKUS. A rich colour of the composition, decorated with stylish decor and accessories, will please a girl, a guy and even a child, and a delicious flower fragrance will fill every house with freshness. Often a blue bouquet of flowers is handed to non-ordinary and creative personalities from Riga (Latvia) as a sign of admiration and recognition. In addition, such a composition can become an original addition to the bride's outfit. To find and order an online flower bouquet delivery anywhere in the capital is easy by contacting KROKUS. The plants used to create luxurious author’s compositions are distinguished by first-class quality and freshness, as well as an affordable price. At the request of the client, professional florists and designers of our studio can decorate flowers with exquisite accessories, decorative plants, stylish packaging, complement with souvenirs and gifts. For example, here you can buy a bouquet of flowers in a blue porcelain vase to give it on the occasion of a special solemn event in the life of your friends from Riga (Latvia). Now to send flowers to riga from anywhere in the world is possible, even without leaving home! To order a brilliant blue bouquet of flowers with delivery in Riga and any corner of Latvia is possible, using convenient functions of the website or simply calling the manager of KROKUS at the specified phone number.